Memorials: to Design Future, 551 Pine Ave. NW, Grand Rapids, MI 49504. 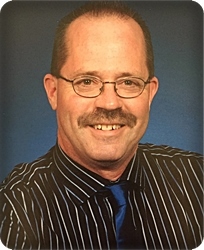 Douglas Wayne Van Meurs, age 61, of Grand Rapids, passed away unexpectedly on Saturday, October 27, 2018, and went to our heavenly home. Doug was born September 11, 1957 in Muskegon, MI, to Peter and Ruth Van Meurs. Heattended Calvin College, and spent his life working as a painter. He loved music and enjoyed playing the piano and organ. He attended Calvary Church and more recently, Ada Bible Church. Doug will be lovingly remembered by his wife, Sally; his daughters, Christina (Keith) Vander Weide, Elizabeth Van Meurs; granddaughters, Mckenzie, Madison, and Maizey Vander Weide; step-children, Tara (Kevin) McCarthy, Erin (Mike) Jones, Michael (Angie) VanderPloeg, Danae (Joshua) Dandrow; step-grandchildren, Michael and Andrew Jones, Elle and Grant Vander Ploeg, Jack Dandrow; sisters and brothers, Deb (Dan) Gasper, Dan Van Meurs, Dorace Van Meurs, David Van Meurs, Derek (Angela) Van Meurs; and many nieces and nephews. The family will greet visitors on Wednesday, October 31, from 9:30 - 11 am at Stroo Funeral Home, where the funeral service will begin at 11 am. Kevin McCarthy will officiate. Interment will be in Blain Cemetery. In lieu of flowers, memorial contributions may be made to Design Future, 551 Pine Ave. NW, Grand Rapids, MI 49504. We are saddened to know that our cousin Doug has gone to be with our Savior. May his family be comforted in their grief by our loving and merciful Lord. Although we did not know him personally, he leaves a hole on the fabric of the Van Meurs/Brondsema Family. May the many happy memories you have with Doug, help you thru this difficult time, and may those same memories in time bring a smile to your heart when you think of them. I am on bended knee offering prayers for you all.